Across Eurasia, alumni of the Future Leadership Exchange (FLEX) program continue to promote civic participation, volunteerism, and community service. They are a family, not by program, but by mission. In Kyrgyzstan, Ignatiy Kim is a vibrant leader in the alumni community. He has utilized his exchange experience to promote civic participation among youth and help disadvantaged communities achieve personal and professional success. After returning to Kyrgyzstan, Ignatiy received a full scholarship from the U.S.-Central Asia Educational Foundation to study Business Administration at the American University of Central Asia. In 2013, he also completed a FLEX to Internship program in the Department of Tourism under Ministry of Culture, Tourism, and Sport. 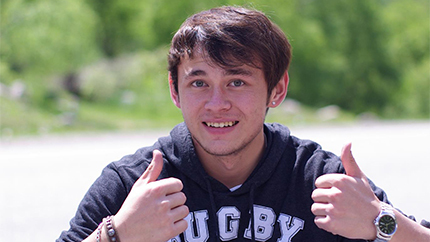 Through his internship, Ignatiy established the Eco-Caravan educational camp to promote ecological awareness for disadvantaged communities across Kyrgyzstan. In recognition of Global Youth Service Day, the first Eco-Caravan program brought together orphans for a six-day retreat to promote a healthy lifestyle, personal development, and implement small ecological projects. The program has been successfully replicated in 2014 and plans to continue in 2015. Ignatiy is also an active leader in Kyrgyzstan’s alumni community. He volunteers as a member of Unity Fund, an organization founded by fellow FLEX alumna Nadia Pak, which seeks to rally youth participation in support of community service projects. The Future Leaders Exchange (FLEX) Program provides scholarships for high school students (ages 15-17) from Eurasia to spend an academic year in the United States, living with a family and attending an American high school.